I have had this beer on several occasions. I always thought it was a good beer but I never thought it was a good representation of an authentic Belgian Tripel. The last time I had this beer was more then a year ago and at that time I thought it was too sweet. It was still a good beer but not quite up to the Belgian purist standards in me. At any rate it will be interesting to try it again. This beer pours a pale copper, highly carbonated with a bright white head. There is no mistaking the Belgian yeasty aromas on the nose. There are also those wonderful fruity and spicy esters; coriander, clove, citrus notes and also maybe a hint of banana. Wow, I’m pleasantly surprised by this beer. I have had this before and thought it was good but too sweet for a real tripel. This is good, very good. Sweet light pilsner type malts up front then a high effervescence over the tongue. The back end of the swallow is almost an explosion of Belgian spicy and yeasty flavors. The finish is very pleasant with Belgian yeasty/earthy notes and a lingering yeasty aftertaste. Excuse me while I eat some crow. This is really a good beer. It’s not one of the best tripels I’ve ever had by a long shot but it is a very enjoyable Belgian style triple. It does not seem to have the complexity of most of the authentic Belgians but it does have all the most of the classic tastes of a triple. I misplaced my thermometer so I can’t tell you exactly how warm this beer is. I suspect somewhere in the low sixties. As this beer warms it develops more of a farmhouse ale funkiness to it; that unmistakable earthy, yeasty, sourness funk. That is one characteristic I never noticed in this beer before. I’m not sure what happened with this beer. It is certainly a better brew then how I remember it from a year ago. Now I know I’m not easier, if fact I am probable more critical on Belgians now then I ever was before. I really think Victory tweaked this beer a little. There are esters and flavors that I never noticed before. As I stated earlier this beer also has some of that Belgian funkiness that was not there before. In my opinion there are very few American brewers that do Belgians well. For a tripel, Allagash and Stoudts are a few that come to mind. This is now one of the few American versions that I like. It is still lacking some the complexities of the authentic Belgian tripels but it is a solid B for me. This is a Very Good Tripel. 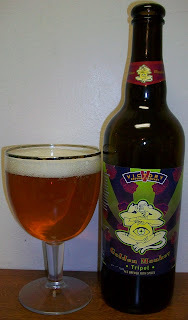 It is also a relatively inexpensive bottle so it would be worth trying to see if you like this style of beer. You can pick up a 750 for around $6.00, compared to $10 plus for an authentic Belgian.